The Silver Queen Fine Art and Dancing Hands Galleries have forged a union with Gartner-Blade Glass. The galleries have decided to produce a joint showing of Stephen Gartner and Danielle Blade’s glass works in time for the Gallery Stroll on Friday, March 25. The reason is simple, said Silver Queen Gallery owner Timm Hilty. 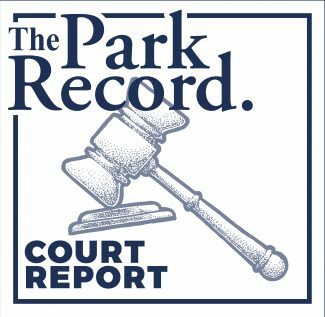 "(Our stores) feature completely different artwork," Hilty told The Park Record. "My store is focused on contemporary works and Dancing Hands sells more traditional glass art. Steve and Dani have both styles in their collections and it just seemed like a fun thing to do." Also, when Hilty moved to Park City and opened Silver Queen Gallery six years ago, he already had an established relationship with Blade. "I had sold Dani’s work for 15 years in my gallery in Arkansas," Hilty said. "When I moved here, I found she was already represented by Dancing Hands Gallery. I was so disappointed because most galleries can be very territorial when it comes to certain artists." Hilty told Blade if there were any of her works that Dancing Hands didn’t carry, he would be glad to fill in the gap. Blade, in turn, contacted Dancing Hands owner Chris Meyer and explained the situation. 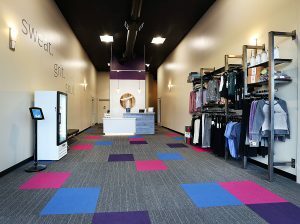 "Chris was very accepting and open to that idea, and, throughout the years, we have been referring customers to each other’s store," Hilty said. Earlier this year, Hilty relocated Silver Queen a couple of doors down from Dancing Hands and felt the need to celebrate. "I wanted to do a show with Dani and approached Chris about doing a show together," he said. "Our idea is to get people to visit Silver Queen and then take them down to Dancing Hands and vice versa." Meyer felt it was a great idea and the two began making plans, Hilty said. "All the vessels, vases and platters that Dani and Steve make will be at Dancing Hands, and I will carry the sculptures and the lighted finials," he explained. "Other than that, we’re going to wing it." Blade is grateful the two galleries decided to team up instead of face off. "So many times smaller-town galleries seem to be at each others’ throats with these kind of things and that doesn’t benefit anyone not the galleries, not the artists," she said during a phone interview from her home in Ashley Falls, Mass. "Tim and Chris seem to have such a great rapport, and it works great for both of them. As an artist, it’s a delight to deal with retailers, who, rather than making an issue, decided to come together." "This particular show is going to have a full, well-rounded showing of our pieces," she said. "Our blown ware and lighting and sculpture pieces are so vastly different that it is essential to have both galleries showing them." Blade and Gartner have worked together since 1995. Blade, who hails from Britain, comes from a line of glass artists. Her father and brothers all work with glass and she started working in the studio when she was 12. "I found it hugely challenging and hugely satisfying when I picked up a pipe and some molten glass and created something with them," she said. "It’s a heavy medium and hot in the summer, and is quite the workout." Blade moved to the United States in 1985 to work with American artists. "Ten years later, I met Steve and we started to get together on weekends to create some new works," she said. "It very soon became clear that these pieces we were making were viable, and we became more passionate about them." Gartner, who has a background in engineering, was a torch worker and translated that technique to glass art. He started out as an apprentice, creating small figurines and honed his craft during his spare time. "I had a good affinity for the art," he said. "I love playing with glass." When the two started working together, they knew they had to also double their efforts to produce pieces that seamlessly melded their styles and perspectives. 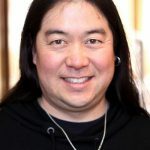 "Tying things together and getting things to flow together, rather than creating something that looked like we randomly stuck a finial on top of some glass jar, was hard for us to do back then," Gartner said. "It all came about after many years of trial and error," Blade said. "We found we have been able to create beautiful and interesting pieces. The response from collectors and galleries world wide is amazing." 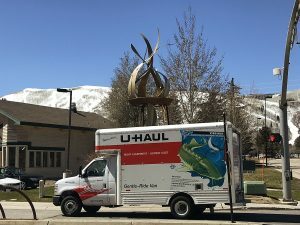 Blade will be in Park City for the artist reception on March 25 and 26, but a temperamental furnace in the artists’ studio will prevent Gartner from making the trip. "It’s like a child," Blade said. "But we couldn’t do our art without having the equipment working correctly. "When I think of real challenges of working with glass I think of the overhead," she said. "There is huge energy consumption and there is the incredibly complex nature of the equipment needed to melt glass at 2,600 degrees and to reheat it at 3,000 degrees and to cool it down to room temperature with our computer programs and ovens." There is also an element of danger when working with such large pieces of equipment, Blade said. "We find we can go years without burning oneself, but when you do, it’s usually pretty serious," she said. "It’s always because we’re not paying attention and have become complacent and disrespectful to the fact of how hot things are. Usually when I burn myself, it’s on the oven in my kitchen, because I have no respect for the thing because it doesn’t look hot." The Dancing Hands Gallery, 591 Main Street, and Silver Queen Gallery, 577 Main Street, will hold a reception for glass artist Danielle Blade during the Park City Gallery Association’s Monthly Gallery Stroll, on Friday, March 25, from 6 p.m. to 9 p.m. The galleries will hold an additional reception on Saturday, March 26, from 6 p.m. to 9 p.m. Admission is free.